EBay generated $2billion in global mobile sales in 2010 across 190 countries. 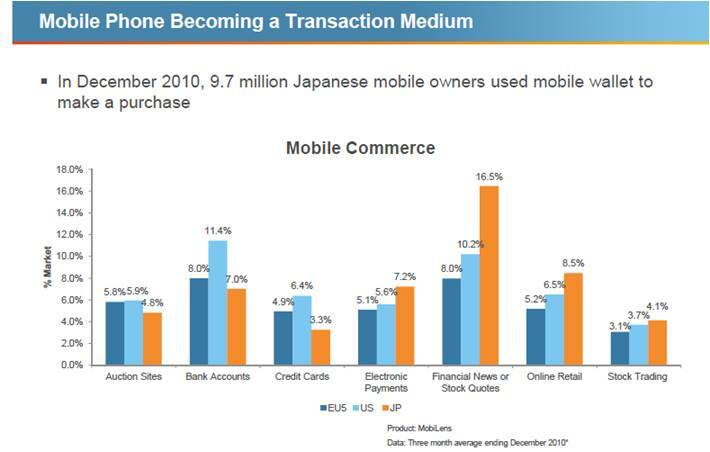 PayPal’s worldwide mobile transactions have skyrocketed from $25million in 2008 to $500 million in 2010. Smartphone sales grew 72% in 2010; 300 million smartphones sold in 2010 globally. There are over 3 billion mobile phones worldwide. Over 40% of the world’s population carries a mobile phone, far more than use a computer or have access to the internet. Mobile Phone is fast emerging as a ‘preferred’ transaction medium. Online Commerce is gaining share vs. Offline Commerce as consumers change their behavior and expectations with rapid development in technology. Any discussion of the potential opportunity must first start with a basic understanding of what we mean by “Mobile Commerce.” Mobile commerce is comprised of two categories: (1) Mobile banking and (2)Mobile payments; Money transfers. Mobile banking refers to situations where the mobile phone is an access channel for financial services. Mobile payments and money transfers apply to situations where the mobile phone is used as a payment device to affect the transfer of value from one party to another. 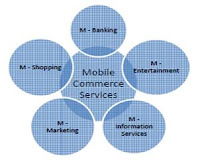 Mobile Commerce has gained increasing acceptance amongst various sections of society in last few years. The reason for its growth can be traced back to technology and demographic developments that have influenced many aspects of the socio-cultural behavior in today’s world. Mobile services have registered impressive growth in recent years, and m-commerce is slowly but surely showing signs of an impressive and healthy growth. With the advance of the technology and the internet penetration, the traditional way of a business transaction has totally shifted from a brick-and-mortar store to a virtual store, and for what it is worth, we can see that the development of the e-commerce and m-commerce is unstoppable. 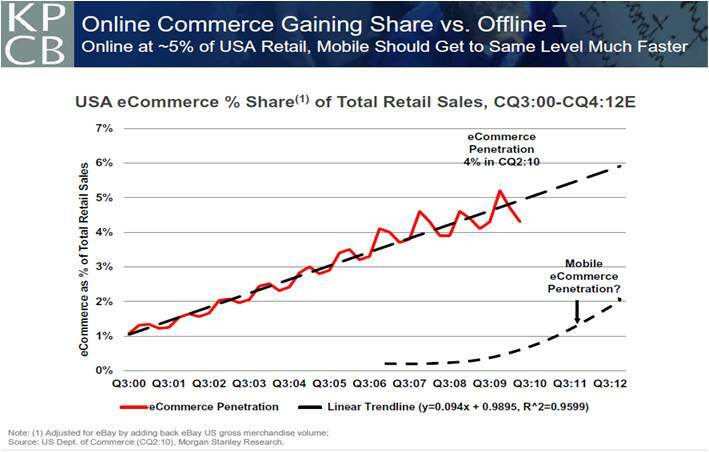 Online shopping trend with the increasing use of the mobile phone internet has derived and urged the development of the m-commerce, which is the Mobile Phone-Commerce( from its attributes and advantage of unlimited mobility). The lines between mobile and social are becoming increasingly blurred. Mobile and Social are bringing about the biggest sea change in consumers’ lives, and brands and retailers should take note of the ever-changing landscape. Facebook is already generating significant revenue from social commerce and micropayments for social gaming and virtual goods. Growth in this channel has been facilitated by advances in technology, trusted infrastructure and applications, and improved customer experience and payment choice (e.g., traditional payment brands as well as new alternatives such as PayPal). Proliferation and Convergence of Mobile Devices and The Internet: The major growth in Mobile-Commerce will happen due to an explosive growth of Internet accessibility across the globe and revolution in the mobile handset market. People are fascinated towards smartphones and social media. The price and technology war in the mobile domain has made smartphones much more capable and affordable for people. Similarly, the extensive and intelligent interconnectivity among people through social media & social networking is also helping as an effective marketing channel for commerce. E-commerce is benefiting from several positive trends, including the continued roll-out of broadband, increasing user comfort shopping online. Rising trust in online transactions: M-Commerce to see wider adoption, driven by convenience, lower-price alternatives to traditional retail, and improved trust & safety. (1) Credible eCommerce companies have helped to improve mobile shopping ecosystem and to decrease fraud and bad transactions. (2) Well-known retail brands are starting to sell products online, with many users having good online purchasing experiences. Well-developed payment alternatives. Shoppers have adopted online banking payment as well as third-party payments (such as PayPal, Square, Zong, Pavyment, Boku, Amazon TextPayMe, Obopay) based on their good experiences. The growth of ‘Social’. Expect social sites to be an emerging and important traffic generator for eCommerce companies. The synergistic relationship between social networks and commerce merchants will fuel growth for both segments. We are already witnessing a fundamental shift in consumer’s behavior and expectations in a ‘social and connected’ environment. 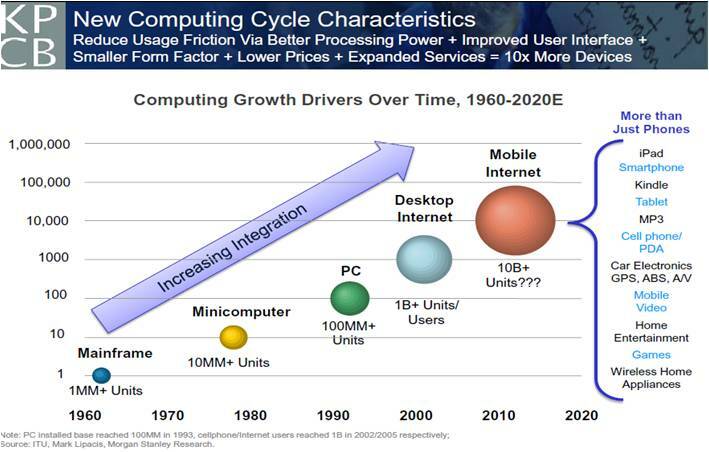 The emergence of highly personalized, location sensitive, and context-aware application and services. Mobile technology allows businesses to become more service oriented in what they do for individual consumers. Consumers respond positively to businesses that take the time to understand their needs and offer excellent customer service. Real-Time Social Features are Accelerating Mobile Usage. Meeker says that mobile Internet usage is ramping up substantially faster than desktop Internet usage did, a view she and her team arrived at by comparing the adoption rates of iPhone/iPod touch to that of AOL and Netscape in the early 1990s. 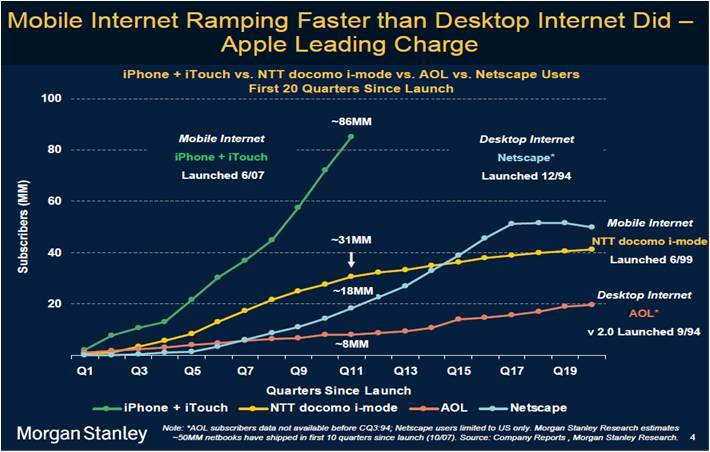 According to Meeker, adoption of the Apple devices is taking place more than 11 times faster that of AOL, and several times as fast as that of Netscape. Helping to drive this is 3G technology, which recently hit an “inflection point” by being available to more than 20 percent of the world’s cellular users (although penetration is only 7 percent in Central/South America and 13 percent in Asia/Pacific — excluding Japan, where it’s 96 percent). Convergence of different technologies on single devices that are available anywhere and anytime is allowing existing technologies (such as the internet) to evolve and extend their reach even further. E.g. Near Field Communication (NFC). Over the past ten years, Mobile phones have changed the way that we live and work. So what is the nature of this change? On one hand, it’s a change in personal freedom, the mobile phone seems to give us more power as individuals to do what we want and be who we want to be. On the other, more and more smartphones and devices are on the market, retailers are increasingly launching mobile-friendly sites, applications and SMS programs and consumers are adapting to the idea of shopping on their mobile phones and devices. Smart retailers such as BestBuy, EBay, and Target have already proved that they can make mobile commerce an experience worth returning to. These companies see mobile as not only a commerce opportunity but an opportunity to learn more about customers and serve them better across the enterprise. As the world awaits the coming revolution that will result when Near Field Communication technology is preinstalled in every handset and RFID readers are incorporated at every point of sale, retailers should consider launching mobile commerce- enabled sites. Established players such as Amazon.com and eBay’s PayPal have reaped the rewards of getting the mobile payments experience right, and start-up vendors are currently jockeying for position. Mobile payments players: On the more nimble retail front, Verrus, Square, Zong, Boku and a host of others are creating the mobile payment systems that provide that “pay me anywhere” feature. Mobile Commerce is fast gaining acceptance amongst various sections of the society. Mobile Banking- (availability of bank-related financial services via mobile devices) builds a cornerstone of Mobile Commerce. Mobile Applications are increasingly being employed by many banks around the world to generate additional revenues, reduce costs or to increase customer satisfaction, often with very promising results. It’s going to be a long time, before wallets become as redundant and unnecessary as wrist watches, for we are still at the beginning of this change. The challenge for businesses is to embrace the M-Commerce trends early — and do so paying close attention to the consumer experience. This means- embarking on a well-thought-out strategy that not only takes into consideration customer buying behavior but also focuses on creating a cohesive Web-to-Mobile experience. So what do you think? Please write in with your comments and views.